It’s time to get over self-sabotage, negative thoughts, and obstacles to getting fit again and staying fit for life. 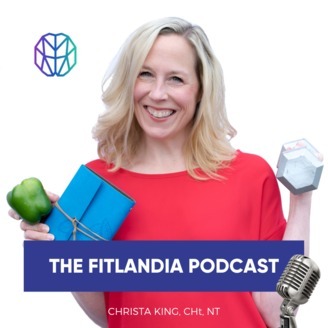 Christa is a certified hypnotherapist, life coach, nutritional therapist, and founder of Fitlandia on a mission to end the vicious yo-yo dieting cycle. Join her each week as she sits down with top fitness and wellness experts to discuss nutrition, exercise, and mental health. 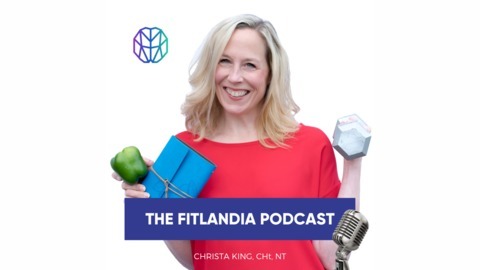 Loaded with quick healthy tips and Fitlandia’s signature Mind Zoning® meditations, The Fitlandia Podcast gives you all the tools you need to commit to a permanent lifestyle change. 05:20 So it started slowly, organically. We put out a show a week and we just kinda kept going and we did a couple shows ourselves, we interviewed some guests, we started to kind of get a feel for what our audience was looking for. It took us about 50 episodes to get our first sponsor and then slowly we started to realize this is becoming a business. 06:14 I was diagnosed with Hashimoto's and the way I was eating and living wasn't conducive to my wellbeing anymore and I drastically changed everything. I went from being vegetarian to eating more of a Paleo and animal based diet, of course with lots of good fats and lots of veggies still, but I, I really turn things around so I could no longer teach that in my cooking classes. 08:21 For me it was just this organic unraveling of love and wanting to learn everything I could about food and teaching. So it's, it's kind of funny that, you know, seven years or whatever it was into my career teaching and educating about health, I had this little wake up call that was showing me that the path I was on wasn't necessarily the right one for me at the time. 15:31 But it took about, I'd say six months to a year before Jesse, my husband and I decided to work with a functional medicine team to go a bit deeper, to get some gut testing done, to go on different protocols to find out what's at the root cause, what's going on in my body, in my blood, in my urine with my hormones, all that stuff to see what's at the core of this or where can we start to clean up shop from the inside out. 21:44 Everyone can eat more vegetables. And it always starts there. And I know it always sounds Cliche, you know, I feel like nutrition 10 years ago saying, eat your veggies. But it's so foundational because so many people can raise their hands in a room and say they are not even having a serving a day. 27:16 Whether it's just raw veggies cut up or whether it's a couple of soups done or a dip or a couple of prepared meats or proteins that are ready to go. You don't have to put everything together. You can just have different components and then every night of the week you can even build each one. It's just something different.